Here's my news of a lifetime. I have decided to retire! Not only have I made the decision but I have met with my supervisor, set the date, and submitted my letter of retirement/resignation. My retirement date is June 30, 2017, and now that I have put it into writing, it is irrevocable according to the human resources rules at my workplace. You know how sometimes you don't know if you have made the right choice until after the thing has happened? Like when I left my leadership role in June 2016 after many months of agonizing over whether I should; it wasn't until after I stepped out the door and began my leave from work that I truly knew I had made the right decision. I wrote about it here. So how do I feel about retiring now that the irrevocable decision has been made? Well, the first and most overwhelming emotion was relief. I felt tremendous relief that my decision was finally made. The process of making this decision has been grueling and it has taken a long time. The uncertainty was hard to live with. I felt light, as though my head and shoulders were floating way above the ground. A huge weight has been taken off my shoulders. My supervisor, lovely man that he is, made the whole process so much easier. I will have an honorary title and be able to maintain an affiliation with my institution after I retire. There is the potential for me to take on short-term contracts. He even suggested that I could request keeping my office and some professional development funds for a time-limited period after retirement. These things go a long way toward addressing the identity issue that has been such a big factor in my anxiety about retiring. I might never take on a contract, and if we move I will not need to keep my office, but just having these possibilities in the background in case, you know, it turns out that I can't figure out what to do with myself in retirement, puts my mind at ease. I felt that time suddenly sped up. There are other decisions that hinge on this one, so making the decision to retire has created a domino effect initiating other decisions and actions. Now we will begin getting the house ready to put on the market, selling it, deciding where and when to move, buying a house somewhere else, and moving. I felt released to act again. While I was in the purgatory of indecision, it was hard to focus on things or to take any steps because I couldn't see my way forward. I was wandering in circles. Since submitting my letter, I have suddenly thrown myself into a couple of projects that I committed to do during my leave. I felt surprised that once the decision was made, it seemed so obvious. Why had I been fretting about it for so long? I felt tremendous gratitude toward Rob for being so patient with me and letting the process play out without pressuring me. In terms of the responses of others close to me, Rob is so happy that I have made the decision, finally, to retire. In fact, I feel a certain degree of guilt for having been so focused on MY decision all this time. This decision will have a huge impact on both of our lives, not just on me. Our kids responded with a range of responses. To one, it was no surprise at all. It was obvious that I had been moving in this direction for a long time. Another was completely thrilled and joyful. Another was pleased that I had made a choice that would enhance my own well-being, finally stepping away from the workaholic choices that have characterized my past. And another was cautiously optimistic, knowing how much my work identity has always been so important to me. One hasn't heard the news yet. However, it was no surprise to anyone. To them, it was obvious that I was moving toward retirement and they all clearly thought that it was a good idea. Even my supervisor at work said he was kind of anticipating it. In a sense, I was the last to know that I was ready to retire! I still haven't had a chance to phone my friends and family to discuss my exciting news. But I sure am grateful for all their support, and the many long conversations over the past year helping to talk me through the decision. As a funny postscript, I submitted the letter late last Friday afternoon. That way, I had the whole weekend to "test" the decision. Knowing that my supervisor would be unlikely look in his mail slot until Monday, I had a whole weekend to contemplate the possibility of racing to my workplace and removing the irrevocable letter before he saw it. I didn't do it, of course, but I sure do like to torture myself! Since returning home from our month on the west coast, we have been experiencing cold January weather. It took us a couple of days to unpack and to recover from our sometimes scary two-day drive along icy highways and over snowy mountains. Our two pets travelling with us in the truck (our dog and cat) were very well behaved. I think they didn't want to get left behind anywhere! The past week, the temperatures have ranged from -15 to -28 degrees Celsius, although today it finally was a bit warmer (high of -7). Although we had a great holiday, it feels good to be home. Despite the cold weather, we have managed to be pretty active outdoors most days. Rob has shovelled snow. 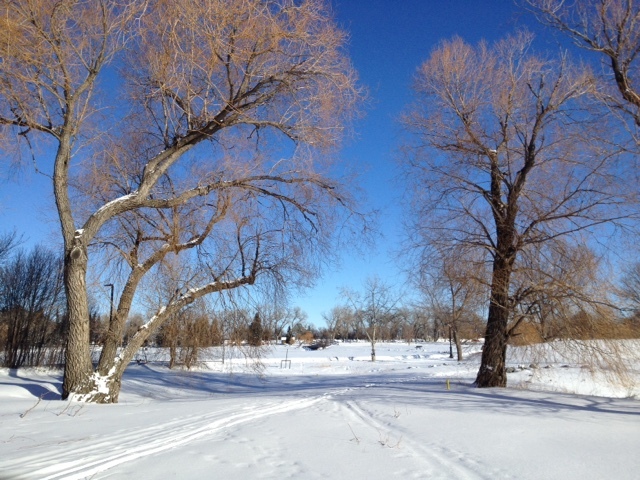 We have gone cross-country skiing three times around a local golf course, where there is a nice five kilometre loop. We also have been out for some walks. 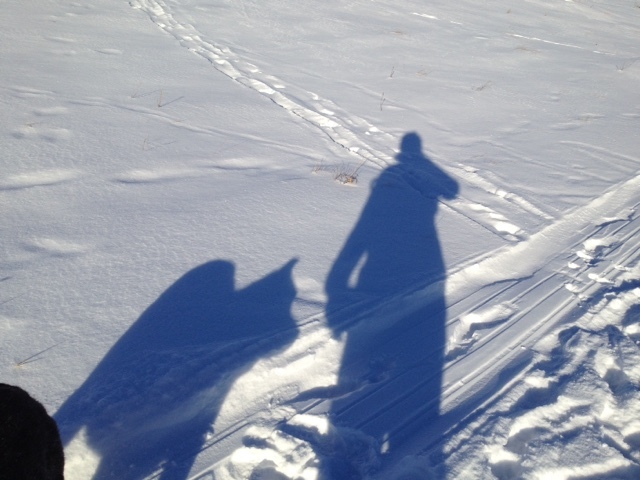 Yesterday, Kate (dog) and I tramped more than 5 km. over hill and dale in the river valley park that we can access just two blocks from our home. It was hard work walking through the windblown snow, especially seeing as I had to break trail much of the way. We came across a herd of 17 deer sheltering in the coulee. Kate must have been as tired as me because she didn't even attempt to chase them (not that she would have had any chance of catching up to them). It was quite spectacular to watch two large bucks that we surprised bound up the hillside right in front of us. The big outdoor highlight of the week happened today. We drove to the nearest ski hill and skied for the afternoon. It was a brilliant sunny day, although about -12 degrees and windy. It feels great to be on skis again after last year's enforced absence. 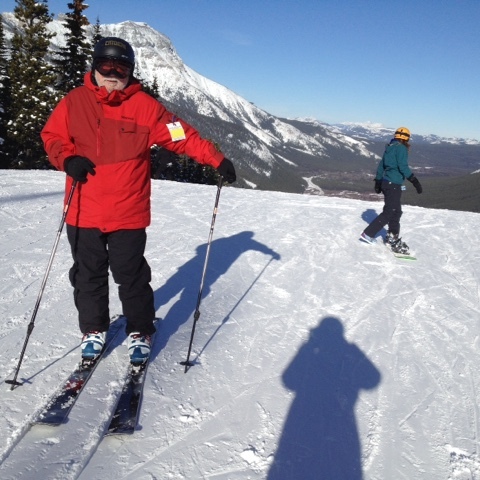 I have skied all my life, and recently I have taken up telemark skiing. It is a lot of fun to learn something new. We took it easy today, as neither of us really has our ski legs yet. This is only our second time skiing this year. We have been out to a movie (Rogue One) and out to dinner to two of our favourite ethnic restaurants. I have worked on writing the first draft of my novel a bit more, and it's now up to more than 47,000 words. I've also done some baking -- just what we need after all those Christmas treats! I have spent some time at my office. We also have spent lots of lazy time on the couch in front of the fire. I did one new thing that I am feeling quite excited about. A few years ago, our city built a new community arts building. It has studios for visual arts, pottery, sculpture, and woodworking, as well as music and dance studios, an art gallery, and a multipurpose room for performances. Yesterday evening, I went down to the arts building and met up with some new friends there who are also painters. A member of the staff, a lovely young man named Andrew, gave me an orientation to the 2D studio, and showed me how to sign in. Now that I have registered, I can drop in and use the studio anytime. The building is open from 9 am to 10 pm, and for $5, the daily drop in fee, I can stay as along as I want. Or I can purchase a monthly or annual membership at a reasonable rate. I stayed the whole evening, and began work on a new painting. Although I have room in my home where I can paint, I like being part of a studio where I can interact with other painters. I made a mental note to myself that if I were retired, this would be the kind of thing that I would have the time to do as often as I wished. The new year also has brought creative inspiration to Rob. He has begun to work on designing the next pair of speakers that he is planning to build. All in all, I would have to say that we are off to a good start in this happy new year. Now as I approach the age to begin considering retirement, I have discovered that I am stumped about where to settle for our retirement years. Where will home be? What makes a home? Although I grew up in a small town, the same town where my father grew up and where my mom and some siblings still live and I spent all of my early years there, I have moved a great deal since first leaving home to attend university. I have lived in three Canadian provinces and in nine different communities. I have returned repeatedly to certain communities, such as Vancouver, to live there at different stages of my life. I have also lived in various other places on a short term basis of a month or two. I have owned five houses and have lived in rental accommodations, including apartments, a shared house, and university dorms, and I have lived with family and with friends' families. As I think about where to settle in retirement, I have the feeling that I belong nowhere. That is the consequence of moving so often. Just as I began to set down roots in each place, I was off again to somewhere else. The moves were all related to work opportunities, schooling, or to follow a partner's job. Now, with the most recent job move, we have ended up somewhere far away from family and friends. Although we love our house and have begun to grow comfortable here, we know that this is not where we want to settle for the rest of our lives. At the same time as feeling as though I do not have one single home, I could be comfortable living in many different places. I have moved before, and I can move again. It will be just fine. What makes it hard is that we want this to be our last major move. We want it to be a place that we can settle into and make it our home. We want to be closer to our kids and grandkids, and our friends and other family. We want the place to have a small town feel; we don't want to live in a city. 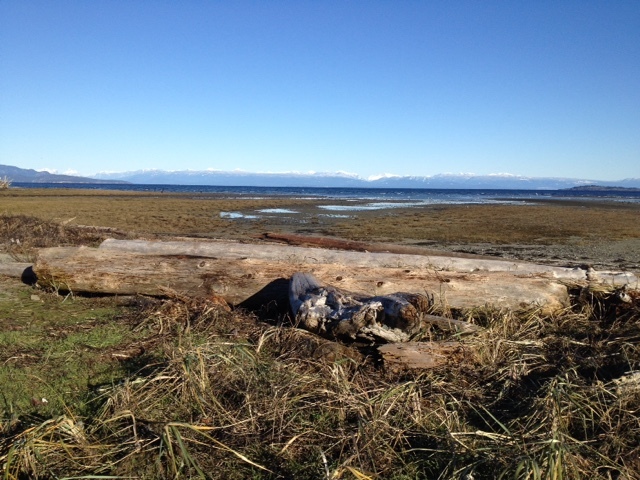 We have just returned from a month in a rental holiday home on Vancouver Island. We had a wonderful time spending Christmas with my daughter and her family, and my two other grown children who presently live in that area or nearby were also with us for Christmas. It was so good to be close together for the holidays. In a sense, we were also trying out what it would be like to live there. Neither of us have ever lived on Vancouver Island for more than a short stint. The climate and lifestyle shares many similarities with the part of BC where Rob spent most of his life, but the winters are not as harsh and there are better health services nearby. On the other hand, the climate is damp, which seems to exacerbate our arthritis. However, many of our friends and family live in more northerly parts of British Columbia. So although living on Vancouver Island would bring us much closer to my grandkids and a little closer to those in the north, there is no perfect solution that would allow us to be close to all of our loved ones. We were also a bit horrified to discover how quickly the cost of real estate is going up on the Island. We would not be able to afford the type of home that we currently enjoy without taking out a substantial mortgage. We are mortgage free, and do not want to commit to paying a mortgage in retirement. A home in northern BC would be more affordable. Ultimately, we do not know where our kids will end up as they continue to build their careers and their families. Moving to the Island will provide more time with some of our grandchildren in the short term. But in the end, we have to choose a place where we will be happy to settle, regardless of where our kids go and how their lives unfold. It's the "for the rest of our lives" part that is making this decision such a hard one. I know that this is a wonderful problem to have, and I am grateful to have this choice to make. Having wide open choices is much better than having fewer options. We are lucky to have dear family and friends, and wherever we finally end up, we plan to travel often to visit them. Perhaps the reason that I am stumped is that I am trying to make a "perfect" decision instead of a "good-enough" decision. If I reframe it and say, this is where we will move for now, and keep open the option that we might move again when things change, it wouldn't seem like such an impossible choice. Rob's point of view is that we should just pick a place and go for it, instead of researching it so much. Sooner rather than later is also what he would say. Like me, he believes that he could adapt to living in whatever place we end up. I'm the one who keeps searching for a place to call home.